Nynas Nypol 123 is one of the family of Nynas polymer modified binders produced from selected bitumens, primarily in combination with SBS polymers. It is used in asphalts where exception resistance to deformation is required, in conditions of very low temperatures. The existing pavement for road RV3 in Norway was based on a rather soft 330/430 PEN standard bitumen. High vehicle use in cold climatic conditions meant that the road was suffering and its load carrying capacity had begun to fail. The purpose of the project was to install a new pavement with better resistance to deformation and which would last longer than the previous carriageway. Nynas put forward its Nypol 123, a Polymer Modified Binder that is proven to cope well with heavy loadings in areas that experience very low winter temperatures. Stresses of heavy loads against a backdrop of cold weather conditions had taken their toll on road RV3, north of Tynset. The result was low temperature cracking, frost/thaw cracking and wheel tracking problems. A climate map of Norway, developed for a project called New Asphalt Technology, was used to help specify the most appropriate solution. The local climate was categorised as PG 52-34, which meant it could expect to see minimum temperatures of below -40°C. Add to that an average daily traffic load of between 1800 and 2600 heavy goods vehicles and long trailers, it was evident that a modern, high quality road reconstruction was needed. Repaving was carried out on this stretch of road in the autumn of 2009. A total of 1300t of bitumen was used and PMBs featured in both a new surface course and some carriageway reshaping. The new pavement was 'glued' using a modified tack coat to the old pavement. For comparison, some sections of the road were paved with regular 70/100 and 160/220 PEN bitumen. The PMB chosen for the resurfacing was Nypol 123, a binder with a proven track record in the north of Sweden. It was supplied from the Nynas PMB plant in Gothenburg to he Mesta Asfalt plant in Tynset / Alvdal. Distribution and production of the material, as well as the paving, were carried out without delays. This application is of great interest to the RA technical department. A joint project group was formed, involving Mesta Asfalt, RA and Nynas. The group will be following the development of this project to see how the asphalt performs in cold weather conditions. Samples will be taken during the life time of the carriageway to investigate the effect of extreme cold on the asphalt. Nynas's laboratory in Nynashamn will be involved in this testing and the results will be published in a joint report. The belief is that the use of Nypol 123 will greatly improve resistance to deformation, and therefore the life time of a new pavement in harsh conditions. 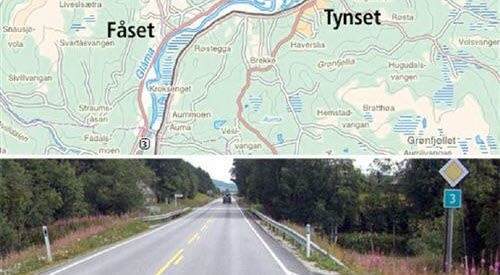 Download this information on how Nypol 123 was used at RV3 Tynset/Alvdal, Norway, as pdf.